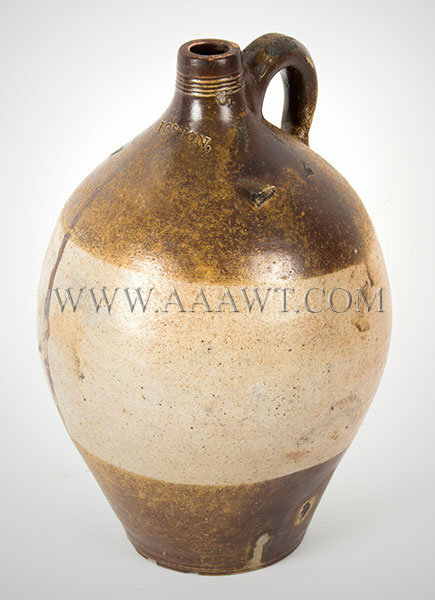 Approximately 3-gallons, spout and bottom half of jug dipped in reddish-brown iron oxide; heavily tooled shoulder, thin concentric band of tooling to neck; applied ridged handle, excellent form. 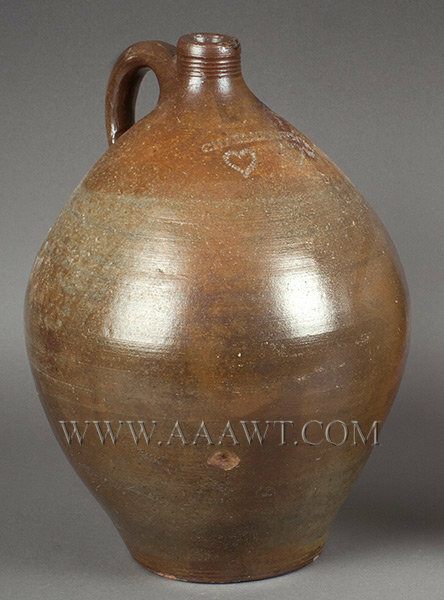 There is a flat chip to side of spot and a small chip to rim, all else good. 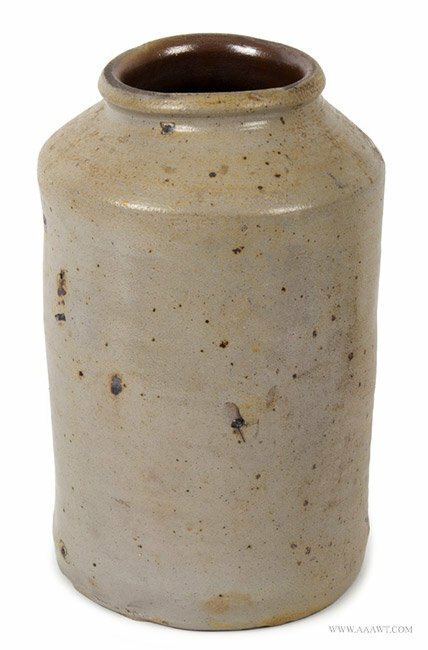 A three-gallon swollen ovoid jar with dipped iron-oxide [thin] from rim to shoulder and a thin band at base; stamped “BOSTON” over impressed “3” indicating capacity (Frederick Carpenter, Boston, Massachusetts, circa 1793-1797). 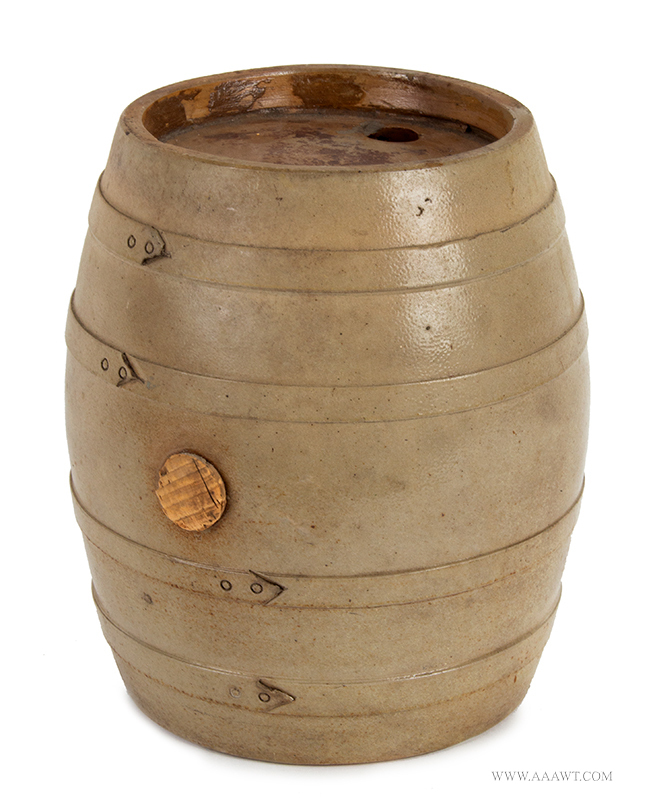 Featuring applied loop handles; incised accent tooling to rim, shoulder and base; interior with Albany slip. 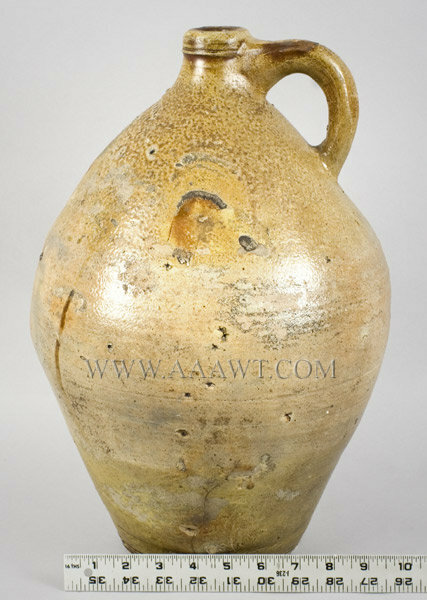 Nice condition with scattered and minor in-the-firing flaws. 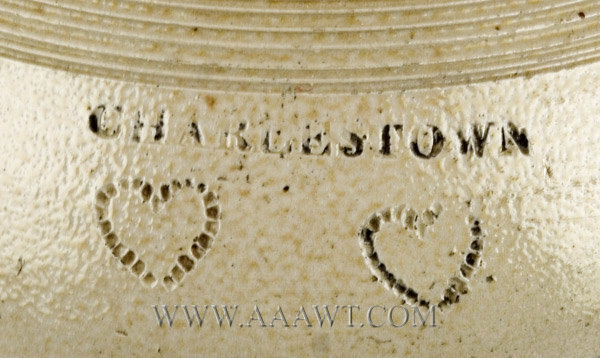 LITERATURE: See the Magazine Antiques, June 1972, an article "New Light on Boston Stoneware and Frederick Carpenter," by Lura Woodside Watkins, author of Early New England Potters and their Wares, pp. 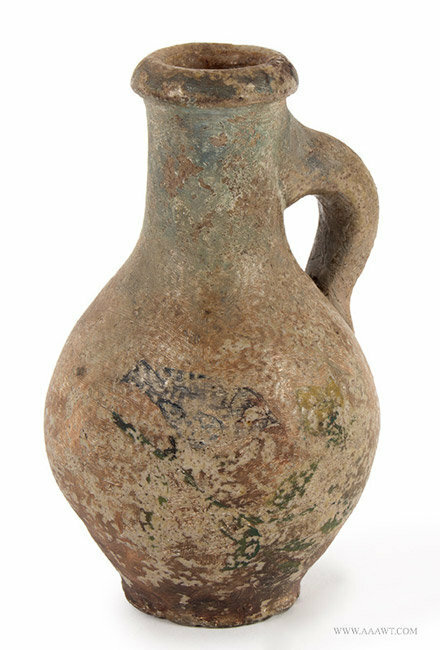 1052-57. 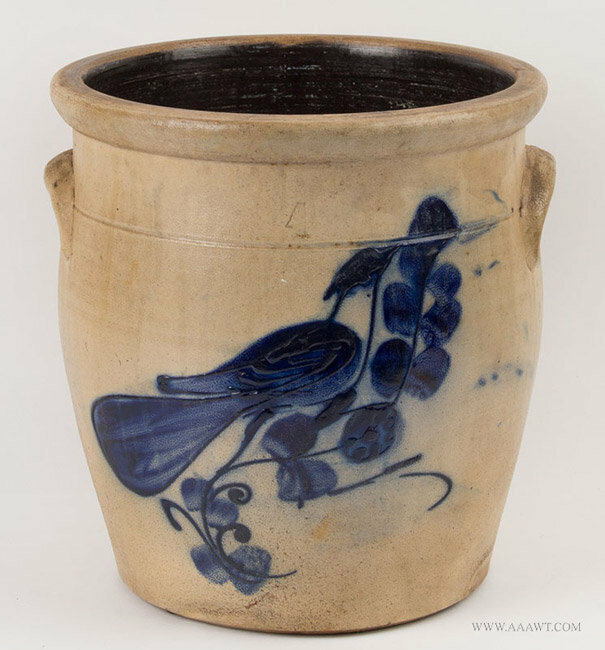 Semi-ovoid with tooled collar, semi-rounded rim, applied lug handles; deep, dark, greasy cobalt blue decoration featuring a detailed bird perched on flowering vine. 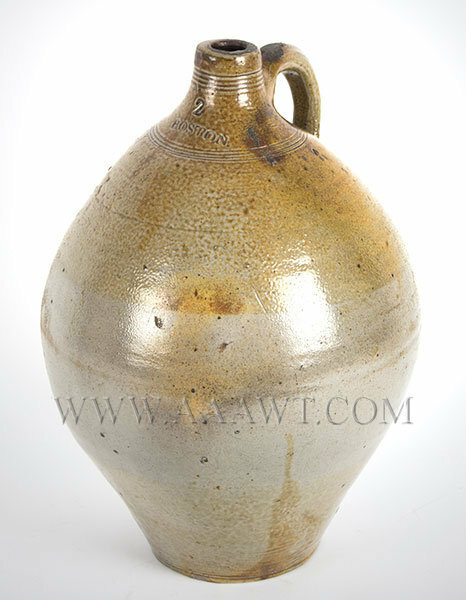 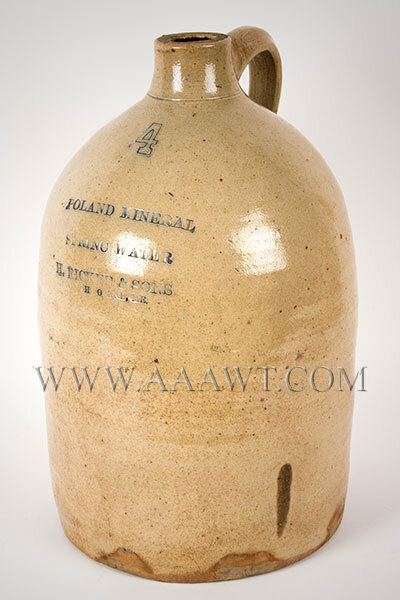 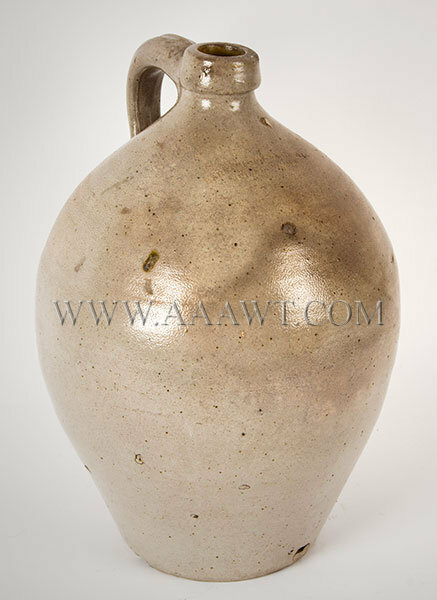 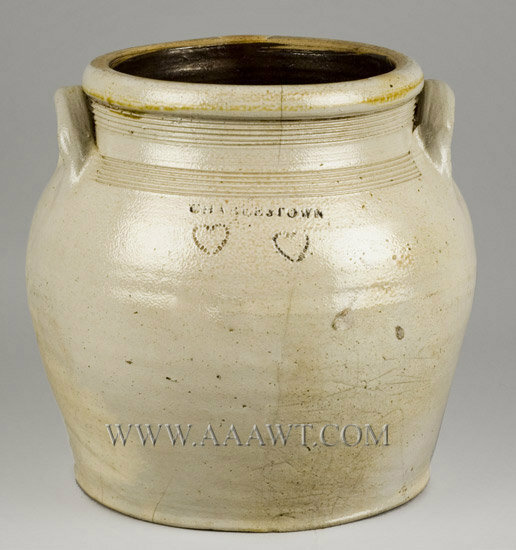 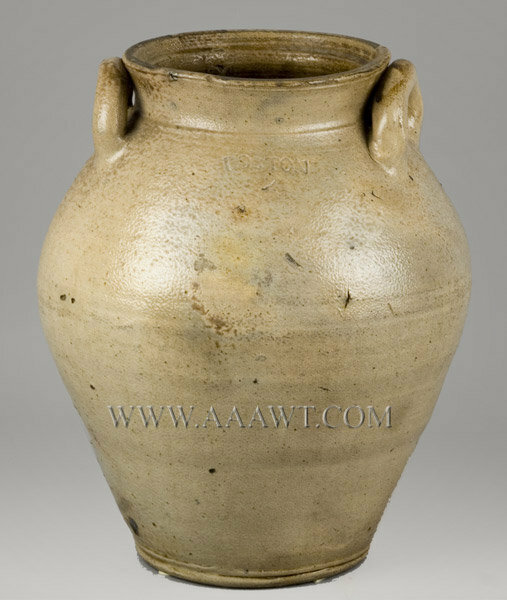 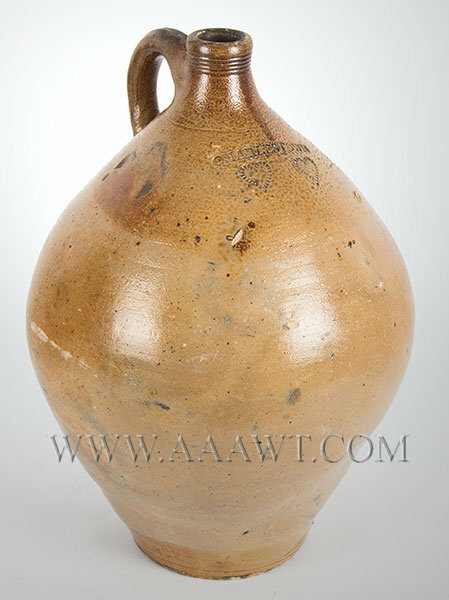 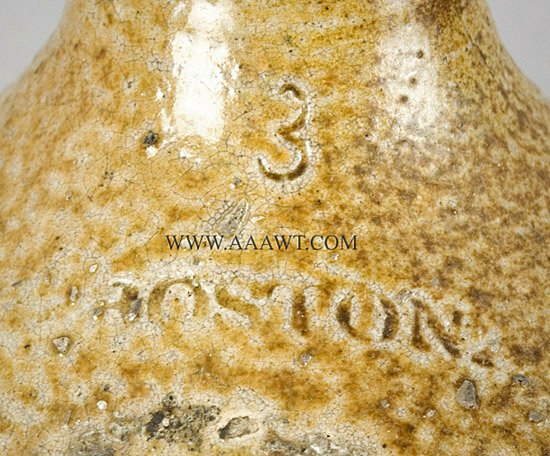 Three gallon jug with transparent brown glaze, tooled and incised neck, impressed "3 over BOSTON"
Approximately five hairlines near incised base, potstones, minor exfoliation. 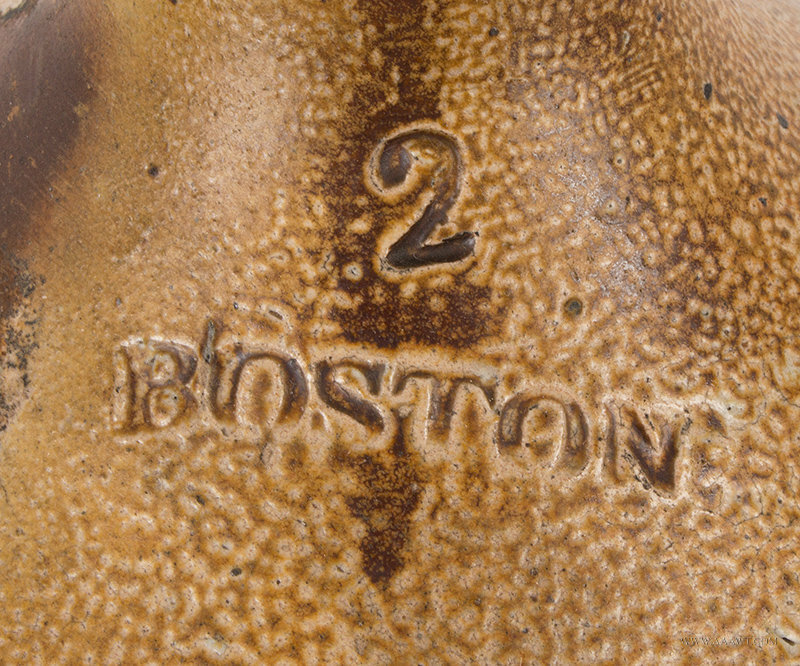 Tin glazed with impressed "BOSTON over 2" attributed to Jonathan Fenton; flared rim, tooled shoulder, and lug handles. 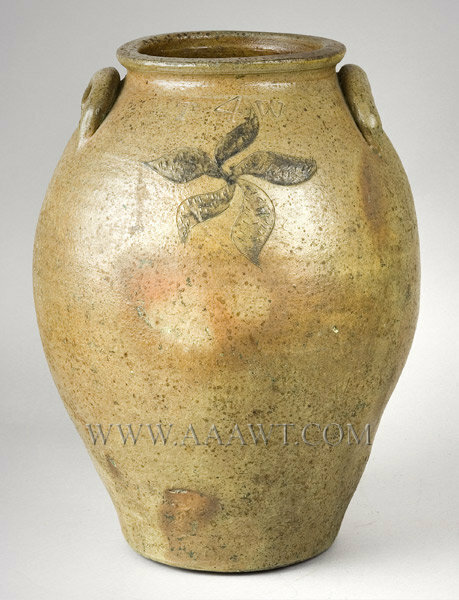 Firing imperfection limited to rear, potstones and a two-inch hairline that does not penetrate pottery. 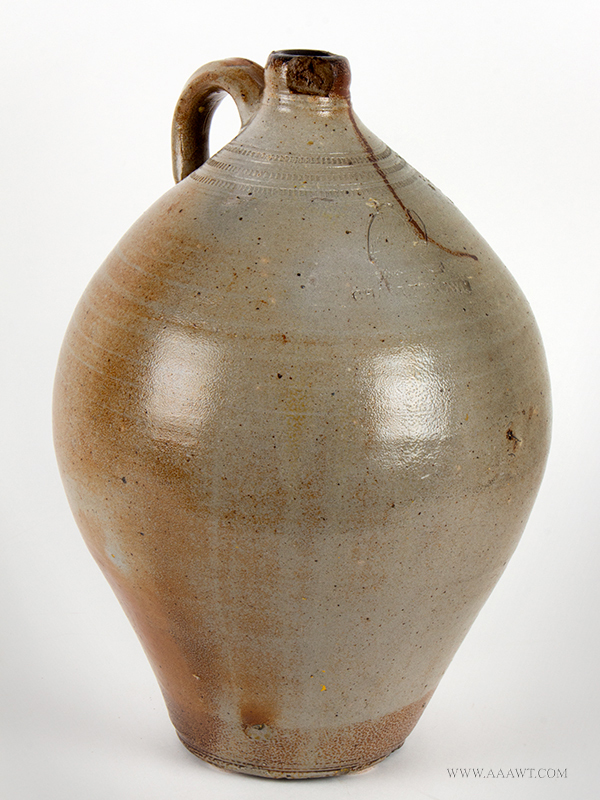 H: 12". 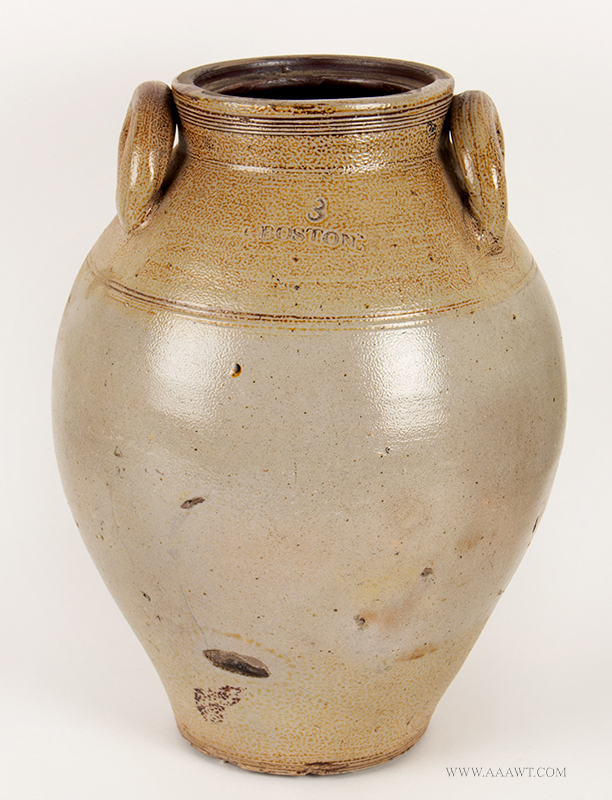 Ovoid with wide shoulder; ringed (incised) neck and molded collar above lug handles. 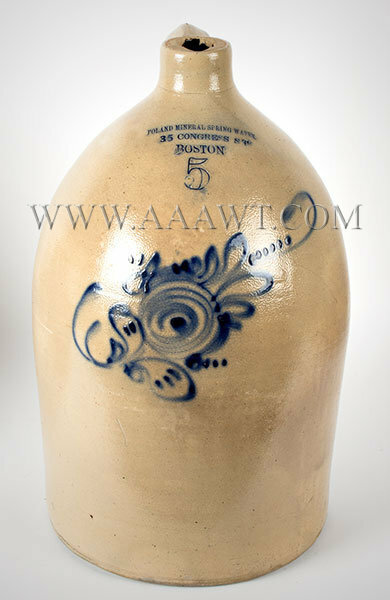 Hairlines and a two-inch deep chip at rear bottom near base. 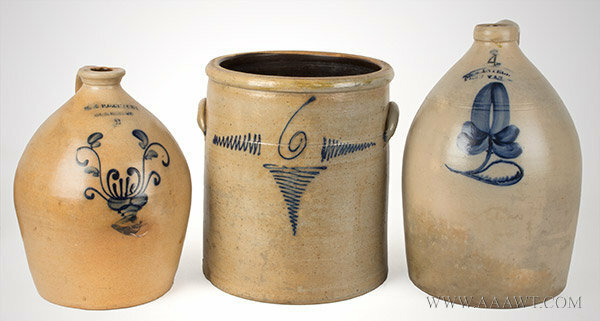 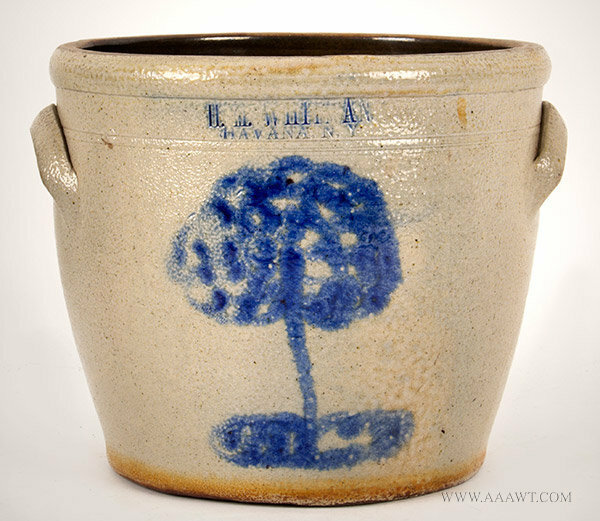 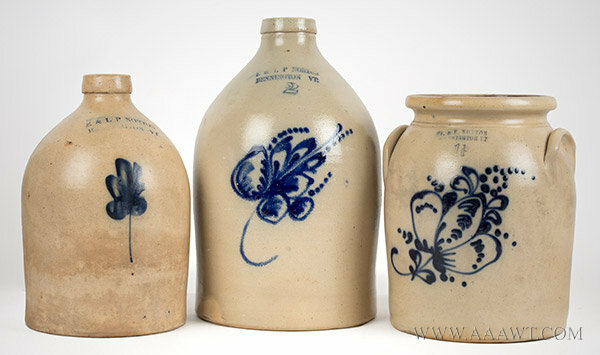 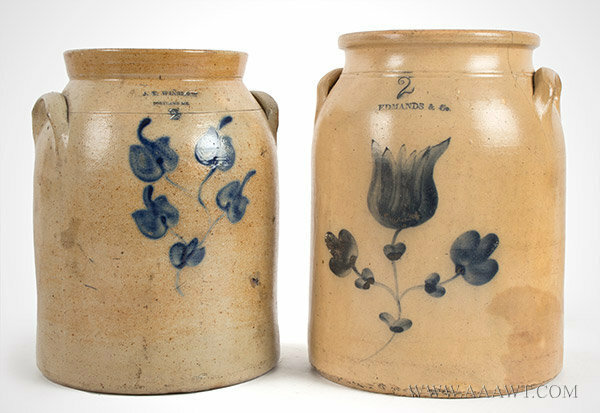 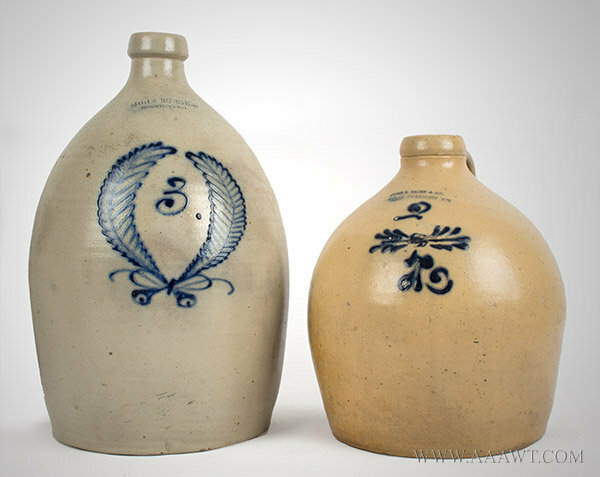 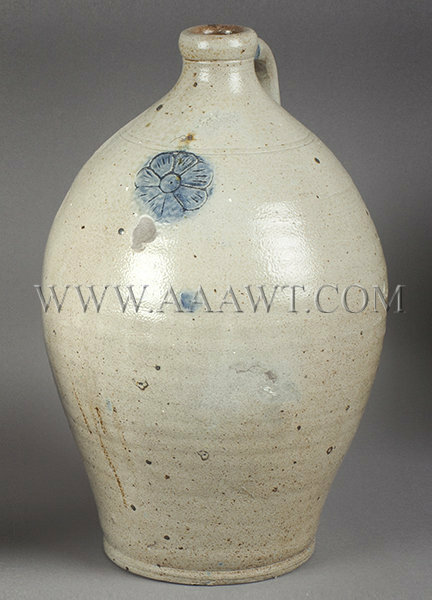 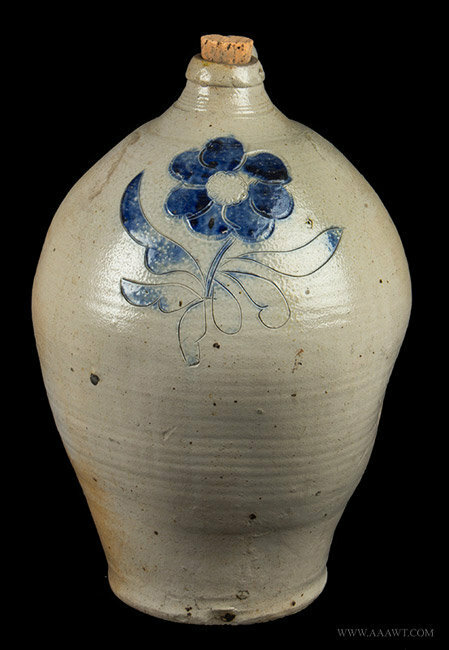 COMMERAWS STONEWARE, Thomas Commeraw, Manhattan, N.Y.
A four-gallon ovoid jar with incised floral ornamentation having a flattened rim, and generously sized lug handles; the front decorated with an incised and cobalt-brushed flower with incised slashes. 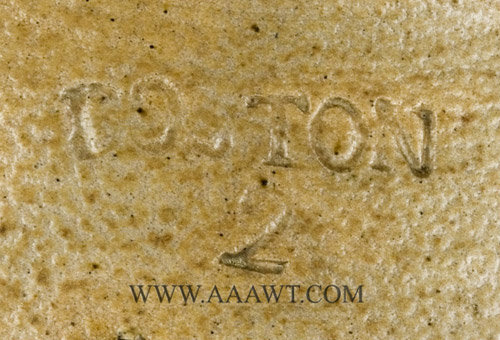 The fairly large impressed mark "T W" centering "4" at the shoulder is thought to be the mark of Thomas Wilbur, who worked near Zanesville, Ohio during the second quarter of the 19th century. 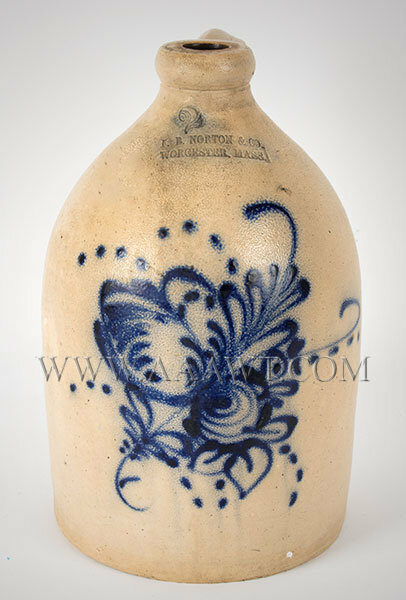 Very good condition, cleaned of paint. 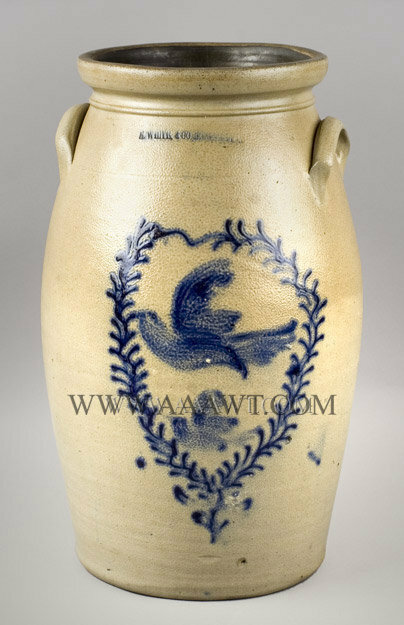 Stoneware Churn, Flying Bird Decoration within Wreath, Cobalt, 19"
A rare large stoneware butter-churn featuring cobalt flying birds with a slip-trailed vine, forming a wreath centering two flying birds painted in brushed cobalt. 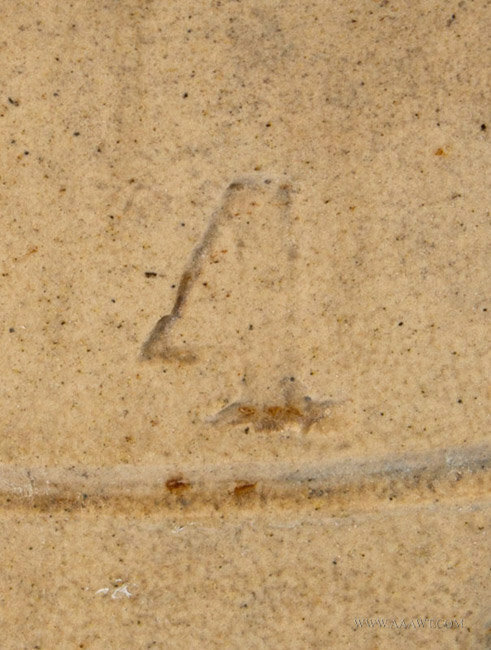 (Lightly incised eye detail to birds) There is an X-shaped crack on underside; crack extends to back of churn; two rim chips on left side; small chip to inner handle and the expected wear to inner rim caused by dasher guide would fit. 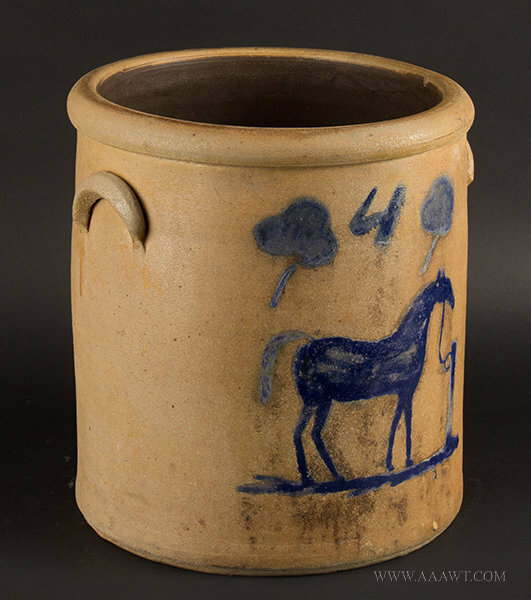 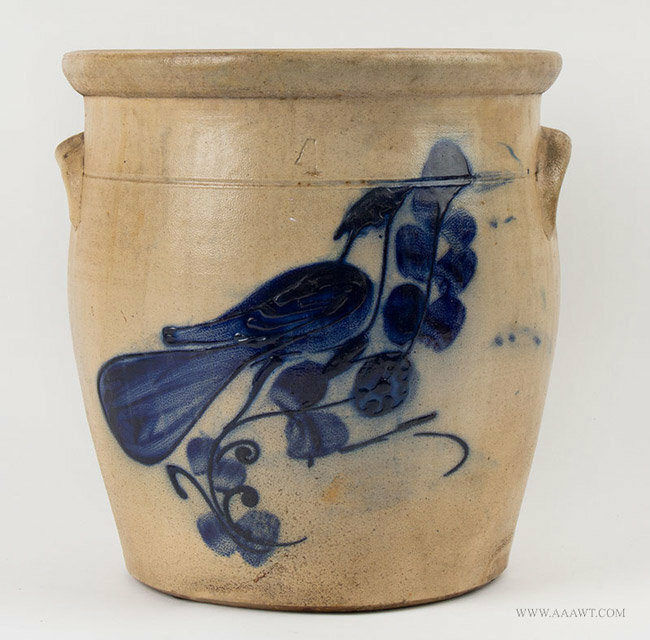 A five-gallon crock stamped by maker then brushed in cobalt; decorated with large bird perched on branch above stump and landscape; script "5" to right of decoration. 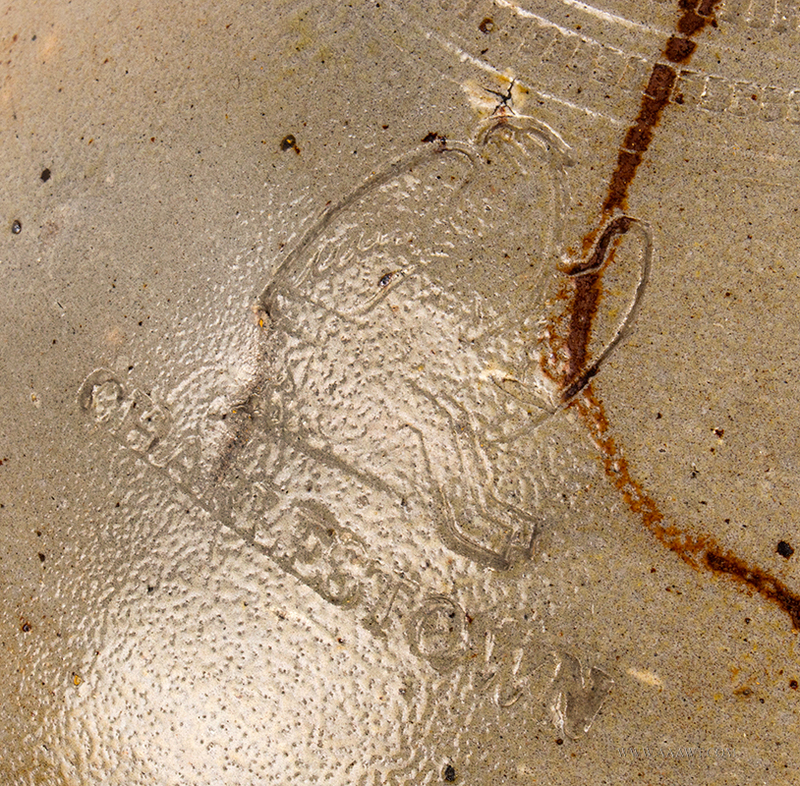 Shallow flake, interior of rim with all else fine. 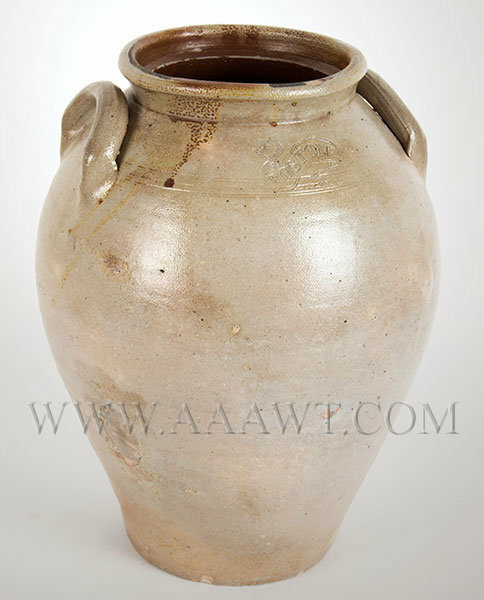 Very good condition with two tiny rim chips. 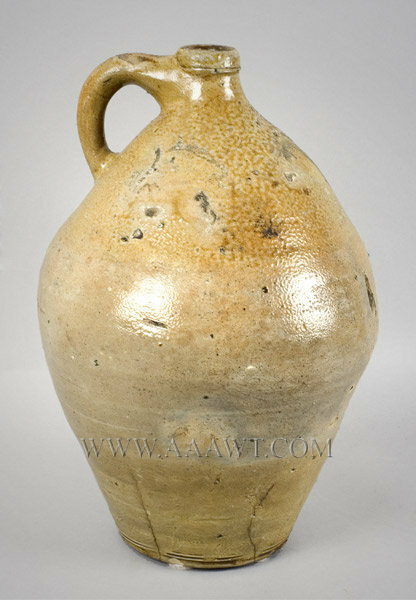 Dimensions: 10.5" H, 11" diameter. 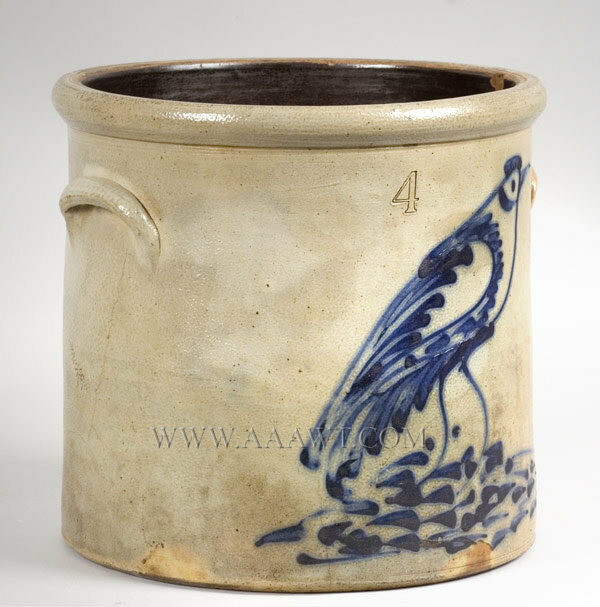 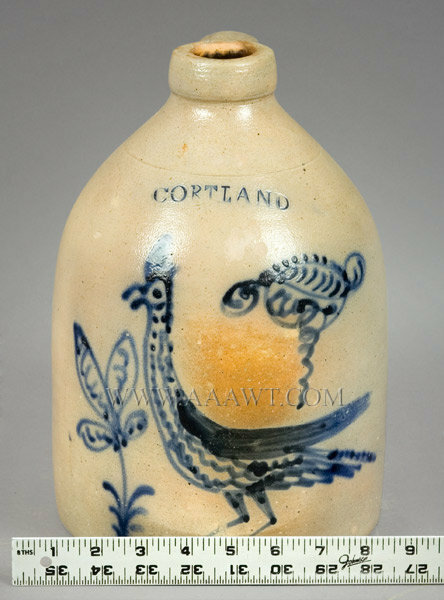 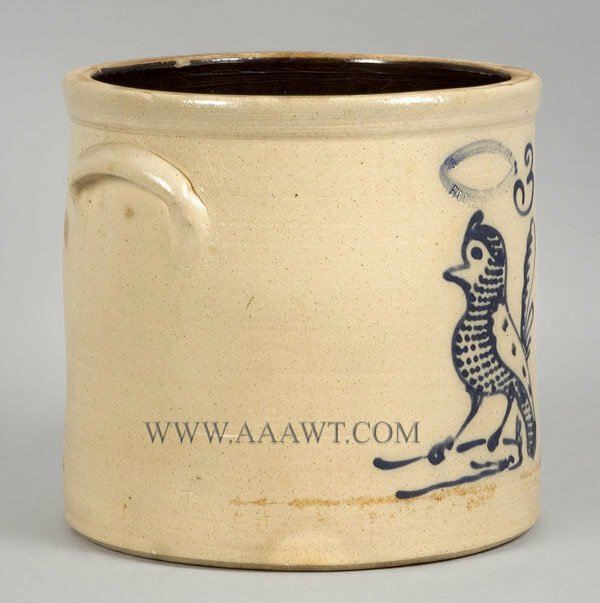 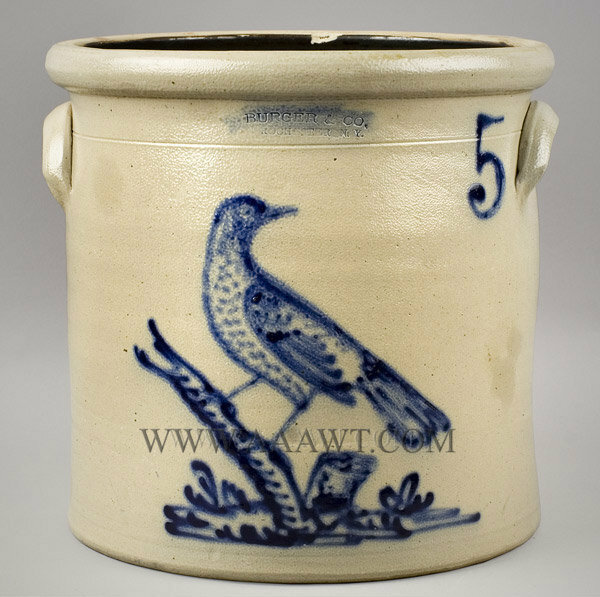 A four-gallon straight-sided crock with applied lug handles ornamented with a large brushed and slip-trailed crested bird. 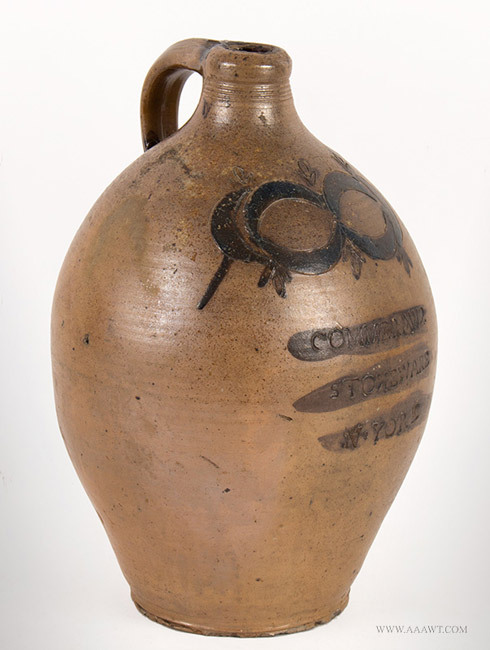 Hairline (spider) under handle to base. 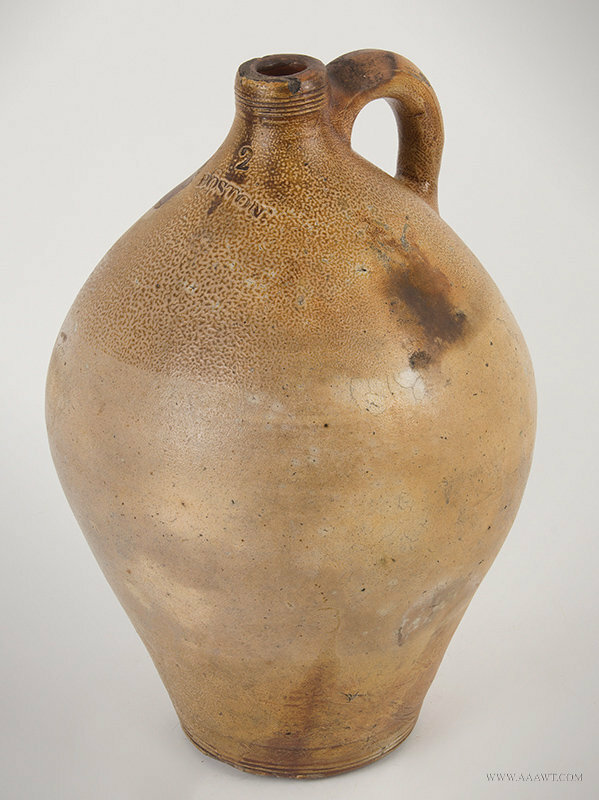 Dimensions: 11" H, 11.75" diameter. 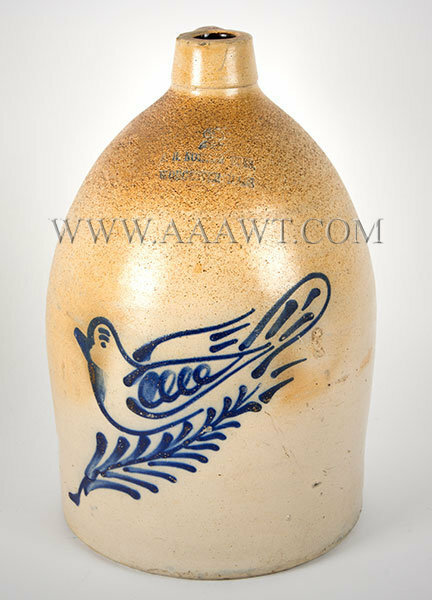 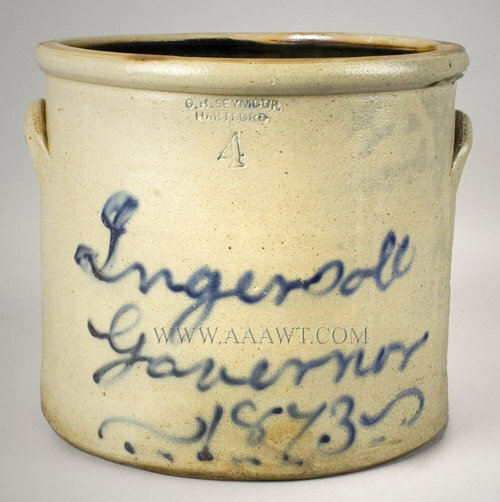 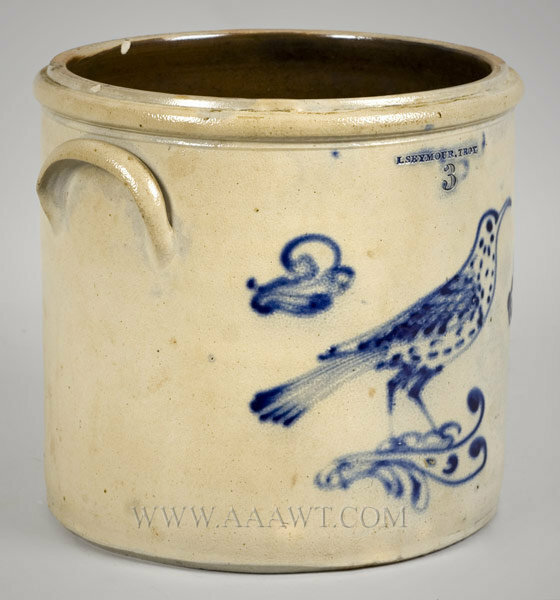 Stamped "J. Burger, Jr. / Rochester, N.Y.
A 3-gallon straight-sided crock with semi-squared rim and applied lug handles, ornamented with a slip-trailed cobalt quail featuring strong feather detail to head and body; slip-trailed "3" to right of impressed maker's mark. 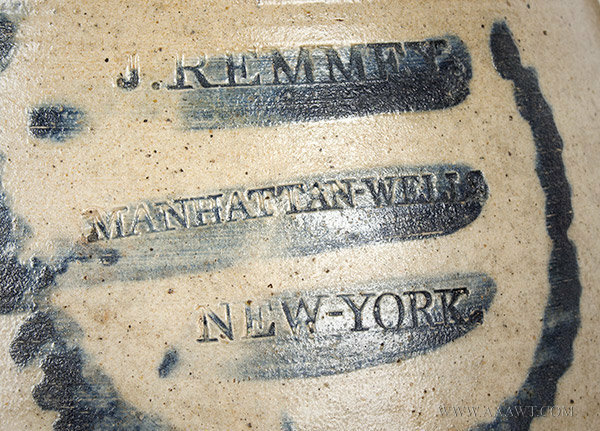 Three small chips to backside of rim interior. 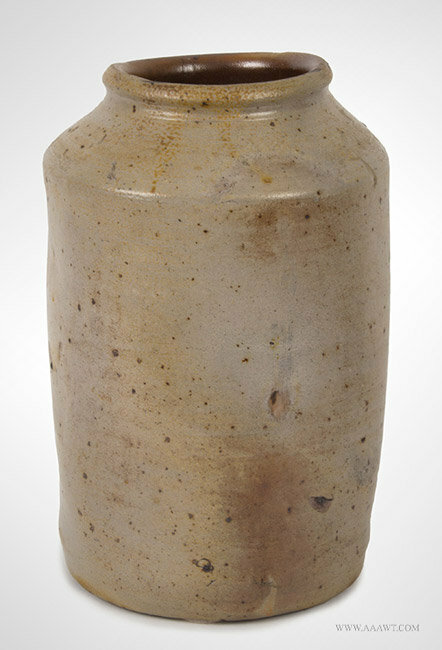 Dimensions: 10.5" H, 11" diameter. 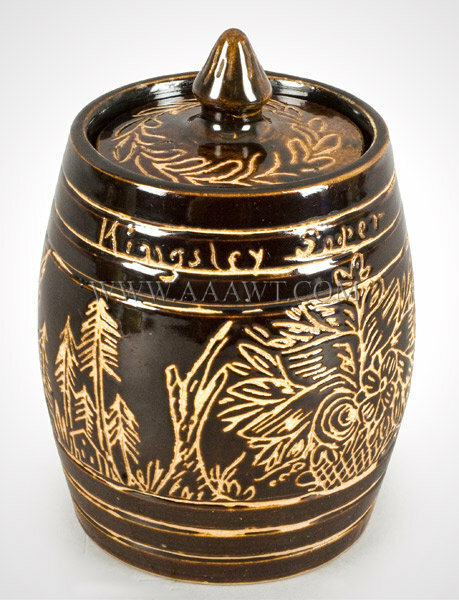 This brown glazed stoneware jar is closely related to another piece of Fort Edward stoneware that is inscribed "Julia Soper" and is discussed on page 255 of Potters and Potteries of New York State 1650 - 1900 by William Ketchum, Jr. An old jelly label within the "Kingsley Soper" jar attributes this piece to Troy, New York. 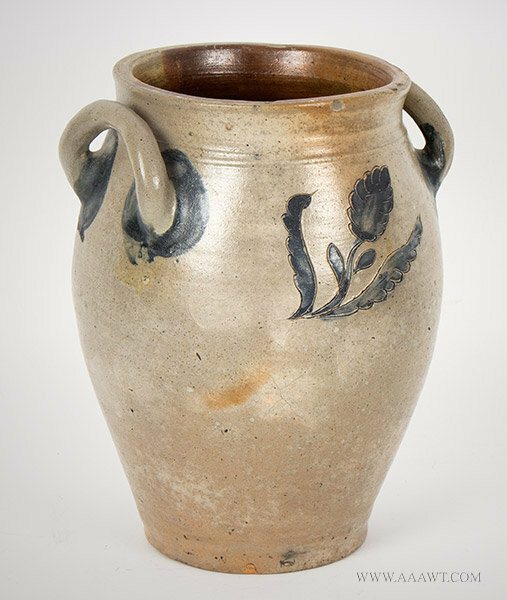 (Warren Broderick in his 1995 book Pottery Works states that Soper worked in Galesville, West Troy and possibly Bennington. 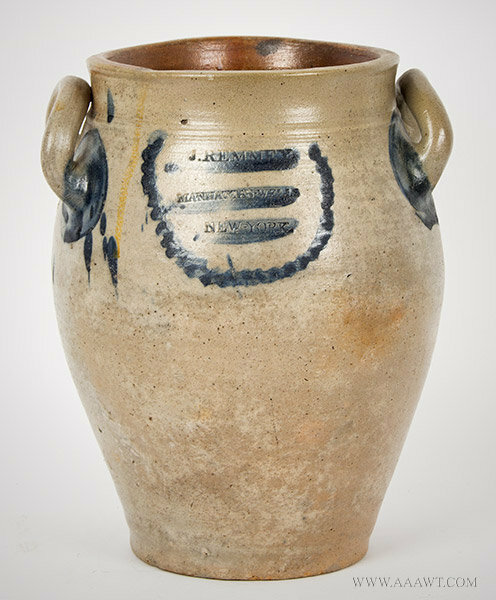 It would seem that Brutis Soper made this piece for his brother Kingsley at his pottery in West Troy.